OceanMedix has designed the Cruiser Prescription Kit for use on a vessel embarking on an extended Coastal Cruise or Ocean Passage where access to professional medical care may be from 24 to 48 hours away. The Cruiser Prescription Kit is to be used in conjunction with a First Aid Manual and compliment the First Aid Kit carried onboard. The Prescription Medications in each Cruiser Prescription Kit have been selected, and provided in adequate quantities, for use in almost any first aid or emergency situation that might arise. 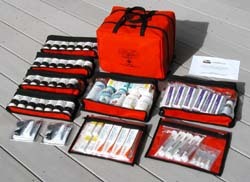 The Cruiser Prescription Kit is designed for a crew size of 1 - 10 people and trip duration of up to 21 days. Each of our kits is assembled to order, not pulled off the shelf, to insure the freshness of each dated medication. The medications are then organized in a case custom fabricated from rugged 1000 Denier grade nylon with heavy duty, self healing, spiral zippers and internal removable pouches. The Physician's Prescription Order and Instructions for Use, and a Use Record / Re-order Form is included in each kit. 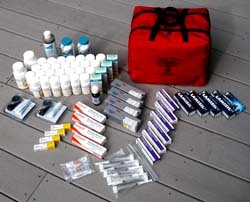 The OceanMedix Cruiser Prescription Kit is dispensed to those embarking on an extended Coastal Cruise or Ocean Passage. Documentation is in the name of the Vessel, the Managing Owner noted on the vessel document or registration; and, where applicable, the designated Captain or Medical Officer. It is designed and intended for use at sea and where direct access to professional medical care is not an option. All medications, medical items and supplies are to be used under the direct supervision of the Captain / Skipper and / or the designated Medical Officer onboard. Whenever possible a physician should be consulted prior to the use of any prescription medication. Additional training may be required for the proper use of medical equipment and supplies. All prescription medications must be administered in accordance with the product literature and all printed instructions. Use of any medication must be terminated at the onset of any side effect or adverse reaction. Size: 8.5" x 11.5" x 9.5"
The OceanMedix Prescription Medical Kits contain medications provided in anticipation of first aid or emergency medical situations that might arise and are not intended to replace any medications that might be prescribed by one's own personal physician. An individual should be fully informed by one's own personal physician with regard to any and all complications and contra-indications that might arise as the result of the use of those medications and in conjunction with the use of any other medication. Article 6.05.1 of the ISAF Offshore Special Regulations states: "At least two members of the crew shall be able to apply simple strapping and plaster casts, undertake skin suturing, insert intravenous cannulae and give intravenous fluids, give both intra-muscular and intravenous injections and apply a temporary dental filling. These Special Regulations have been adopted by almost all sanctioned sailing events and can serve as a guide and comprehensive checklist regarding the preparation of a vessel and the training requirements of the crew, whether sail or power. It is advised that a Suture Pack and a IV Pack, designed and developed by OceanMedix, be carried on any vessel embarking on an extended Coastal Cruise or Ocean Passage where access to professional medical care may be from 24 to 48 hours away. Due to the lack of a diagnosis for an existing medical condition, Prescription Medical Kits are note eligible for reimbursement by medical insurance companies or Medicare. Each OceanMedix Kit containing prescription medications is packed to order. Usually ships within 5-7 business days. OceanMedix Prescription products can only be shipped within the U.S.A.
Click the button below to add the OceanMedix - Cruiser Prescription Kit to your wish list.